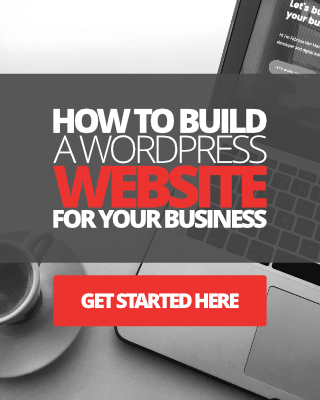 In this post, I will carefully guide you through the necessary steps for creating a WordPress blog from complete scratch, for the first time. First of all, many congratulations for wanting to start your own blog. If you are as determined and committed as I think you are, then sometime in the not too distant future, you'll look back upon this day and thank yourself for taking this step. I'm not kidding you, I know this because blogging has literally transformed my life. I realise that this might sound like such a cliche, but seriously, I went from being broke, practically homeless, and with a struggling business under my belt - to finding success with blogging and online business five years later. (Now eight years later, at the time of updating this post in December 2019). So, in this post, I will take you through the process of creating a WordPress blog from start to finish. Don't worry about a thing, I will try and cover all the essentials you need to know about. I'll advise you on what pitfalls to avoid. I'll recommend a theme to install and use in your WordPress blog, and I'll also talk about which plugins to install and why. Everything else in between, I'll cover as well so that you can make the best possible start to your blogging career. Just to remind you, this guide is aimed at complete newbies wanting to start a blog. How difficult is it to start a blog with WordPress? In all honesty? If you're starting from complete scratch it certainly can be daunting at first. That being said, setting up a WordPress blog isn't that hard to do. You'll see for yourself as you read through this guide. Once you've set up your first blog, you'll be able to do it again a second time around without any guidance. WordPress is a powerful website building tool. For newbies, it can be a steep learning curve at first, but with enough time spent using it, you'll soon become a WordPress wizard. This guide will not discuss starting a blog with a free blogging platform such as WordPress.com or Blogger.com. OK, so here's what we're going to cover. Why? We'll start with why you are starting a blog, plus what it really takes to build a successful blog. (Yes, this part is a critical step of setting up your blog). Choosing and purchasing a domain name. Choosing the right web host provider. 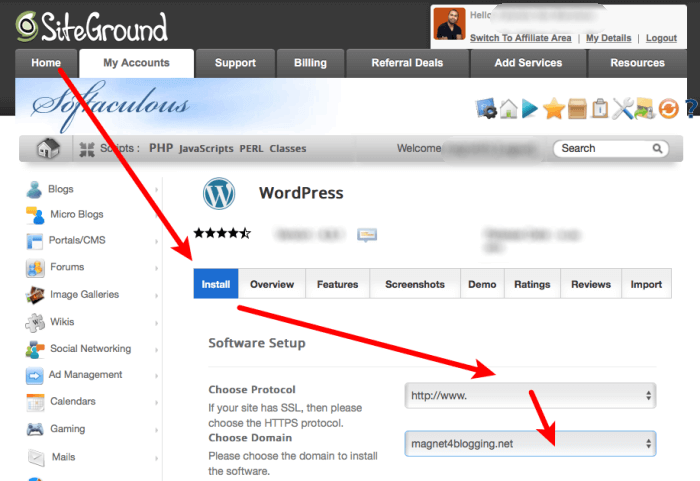 Installing recommended plugins, and configuring WordPress. Installing a theme, plus how to install a theme. If you don't want to read this part, or you don't feel it's important, just skip straight to the next part. However, if you're completely new to the world of blogging and online business, I really urge you to read this part first. 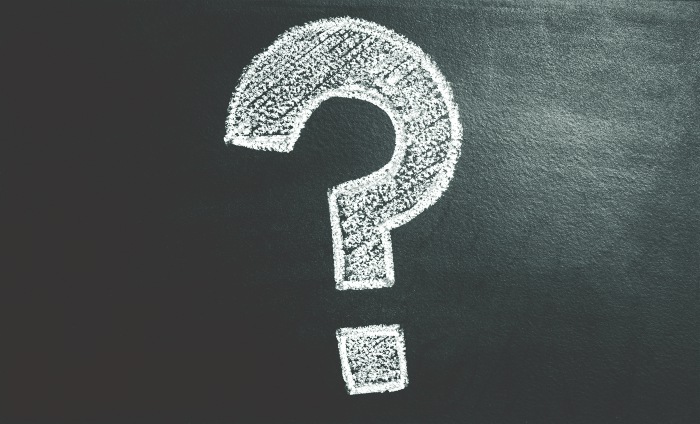 I'm sure you're well aware as to why you want to start blogging, however, let's try and add some clarity to that 'why'. Everything we do in life is for a reason. Why do you go to work everyday? To earn a living and live a fairly comfortable life. Why do you go to the gym? To keep fit. Knowing "why you want to start a blog", like, really know why, will definitely help you to define the purpose of your blog, and of course, to keep you on the straight and narrow path to blogging success. Some will be starting a blog to earn an extra income online. Some will be setting goals with their blogs, perhaps to help them improve their online communication skills. Some will be starting a blog to help the grow their business online. And some will be starting a blog just for the fun of it. Starting a blog for the first time is exciting, and regardless for what purpose, you will find the success you really want if you put your full focus in understanding "why" you really want to do this. When I started my blog in 2010, it was because I wanted to generate an extra income online, since I already had an e-commerce business that I was trying to grow, I imagined that I could use the extra income to help me grow my e-commerce business. As things turned out, my blogging goals and ambitions changed course, and so my why also changed, and that's OK.
You might find that your 'why' might completely change in a few years time. The process of creating a blog is just the first step. It's also the easiest step. These days, anyone can start a blog with a domain name and some web hosting, however, it will take much more than just simply 'putting up a blog' to become successful in blogging. The road to blogging success is a long, bumpy, and unpredictable one, it is not a smooth, 6-lane highway with all the pitfalls mapped out for you. There will be some tough decision making along the way. There will be ups and plenty of downs, but it's important to enjoy the entire process from the day you start blogging. If you're starting a blog with high expectations, that's OK, but please do not set them too high. You're not going to find blogging success overnight, seriously. I've been doing this for 8 years now and I'm still working towards my ultimate goal of earning enough passive income from my blog each month, to not have to provide other services to generate income, as much as I enjoy providing services. Sacrifice some recreational activities like playing computer games or Binge watching Netflix, to focus on building your blogging business. Committing yourself to learning new things and applying what you have learned. 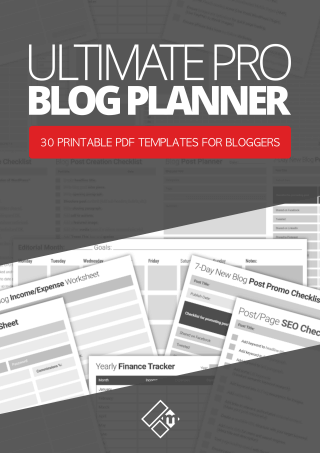 Planning, setting goals, to help you stay focused on reaching your blogging goals. 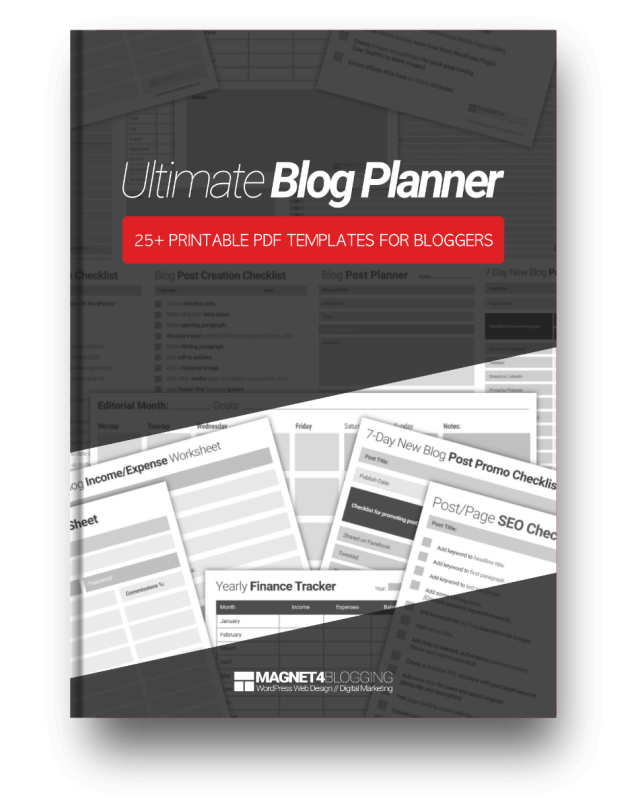 My Ultimate Pro Blog planner will help you become a more organized blogger. OK, let's go through the steps of setting up your WordPress blog. We'll begin with your all important domain name. Remember, in this tutorial I'm assuming that you're completely new to the world of blogging and setting up a WordPress blog, so let's first look at what a domain name actually is. So, how do you choose the right domain name for your blog? Choose a domain name that is the same as your blog's name. Choose a domain name that is 'unique' and 'memorable'. Avoid using hyphens in your domain name. Avoid using your name, unless you want to build a personal brand blog. You can purchase a domain name from any reputable online provider such as GoDaddy or 123-Reg.co.uk, however, since you're setting up a WordPress blog for the first time, the simplest way to purchase a domain name is actually with your web host provider. 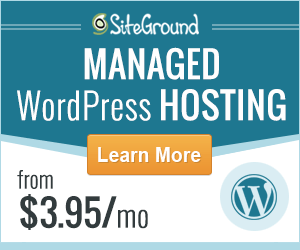 In this instance, I use and recommend SiteGround for domain names and web hosting. 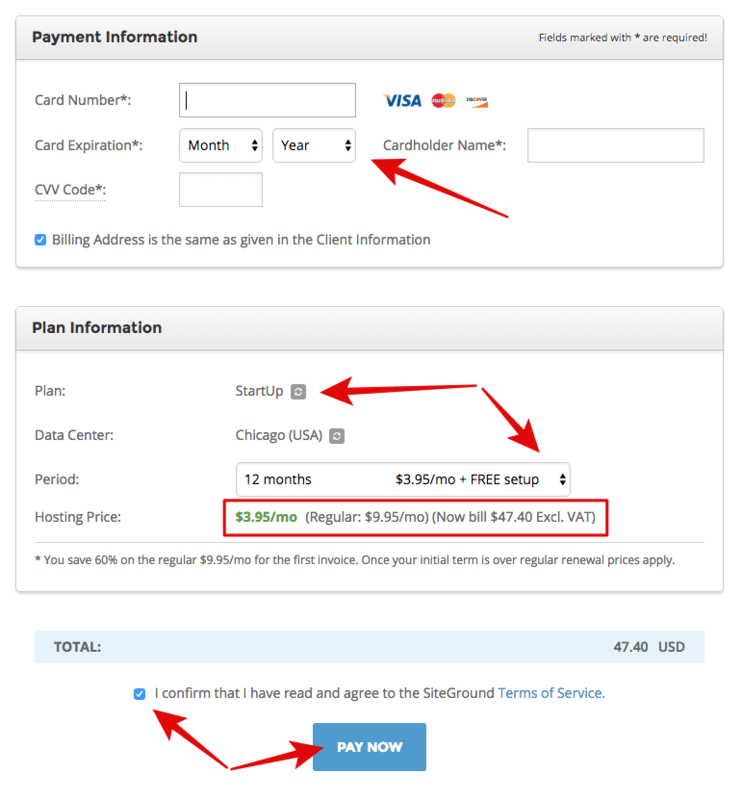 If you're signing up for a brand new account with SiteGround, you can save money on domain name fees since your domain name registration with a new account is FREE. We'll cover web hosting next. OK, so, by now you should have in your mind what you'd like to have as your domain name, it's time to see if it's available and purchase it along with some robust and reliable web hosting. Once again, just to remind you that this tutorial assumes that you're totally new to blogging and the world of web hosting. Imagine a house is built on a piece of land. You go through a real-estate agency to buy land for your house to be built on, right? Well, it's the same principle for a website. A website needs web space, which is provided by a web host provider/company. To keep things even more simple, when signing up for a new hosting account with a web host provider, all you really need is the very basics. 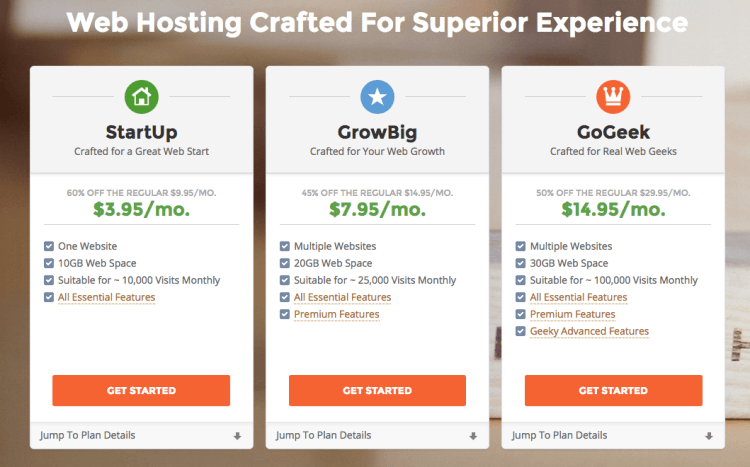 SiteGround offers three shared web hosting packages. For a fresh new blog, I would recommend the Startup plan. You really don't need anything more than that. As your blog grows in popularity and begin to use up more resources, you might want to upgrade to a GrowBig or even a GoGeek account. But that won't come for a while. Click here to check out the latest SiteGround discount offers. Affiliate Disclaimer: I want to make you aware that this post contains affiliate links to SiteGround Web Hosting Services. Should you click on one of my affiliate links and purchase web hosting for your blog, I will be paid a small commission, at NO additional cost to you. I'd like to take this opportunity to thank you in advance for your continued support and hope that you're finding this tutorial useful and valuable. 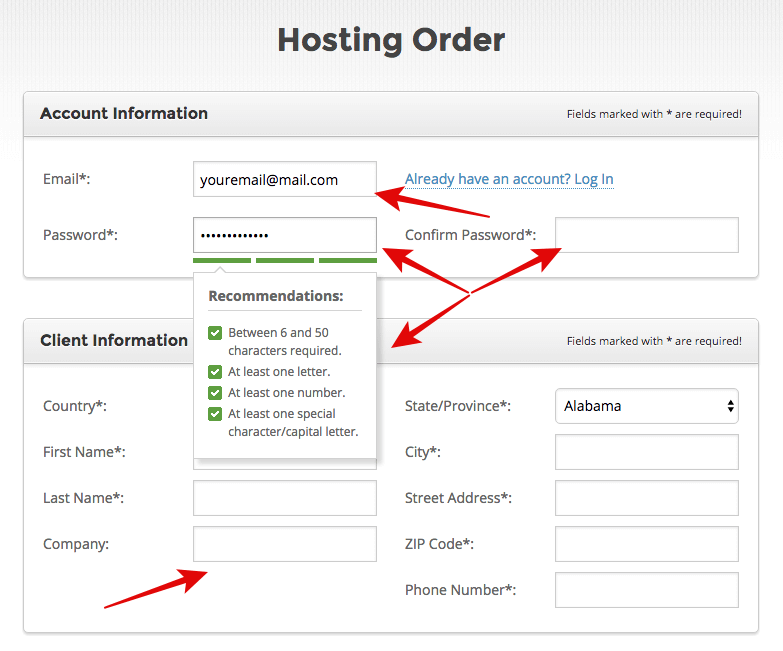 OK, so here's a step-by-step guide on how to get signed up with SiteGround web hosting. 2. Enter client information - Enter information about yourself such as your name and address, company, phone number, etc. 3. Enter payment information - Add your payment details such as credit or debit card information. Check the box if your card details is the same as your address you used above. 4. Select your plan - Select the plan you wish to purchase, select the data center, and period of hosting required to finalise the hosting price. I want to choose a different web host provider, but I'm not sure which one. That is totally cool, if for any reason you don't want to use SiteGround, check out this post I created. It provides additional information and advice on choosing the right web host provider for your blog/website project. Additionally, I created this post to highlight five of the best web hosting providers you can use for your blog or website. Affordability, but not the most critical factor! Reliability and Security (with 99% up-time). Good all-around reputation and credibility. Solid tech support and helpful customer service (The big one). This is probably the most critical part of setting up your WordPress blog, but don't panic as this is also the easiest part. More than likely, your host provider will offer 1-click install. This feature simply means that you can install WordPress into a domain name of your choice, via a hosting provider of your choice, with just a single click of the mouse. Back in the day, you would have to install WordPress via FTP manually, and for a newbie that process could be quite daunting. You can still use FTP to install WordPress today, however, I would recommend using 1-click install feature if you've never done it before. Feel free to check out my quick video tutorial above if you wish instead. 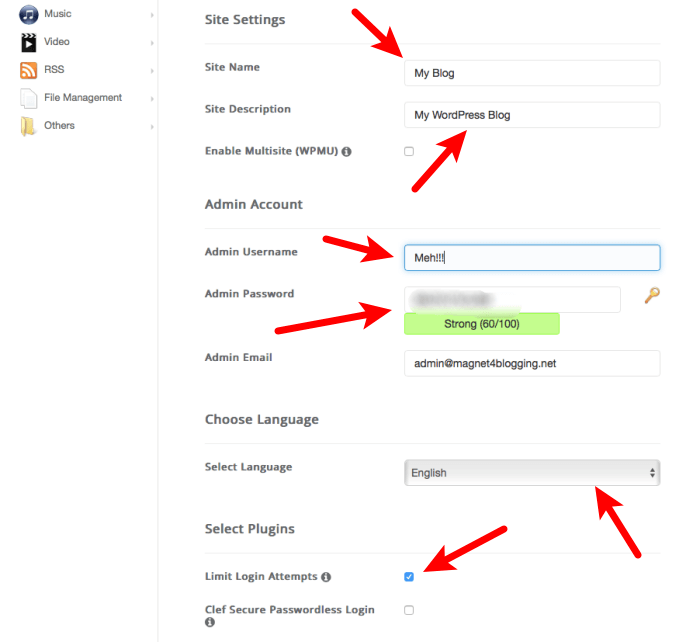 Step One: Log into your SiteGround host account and go to accounts, then hit the Go To cPanel button. See image below. 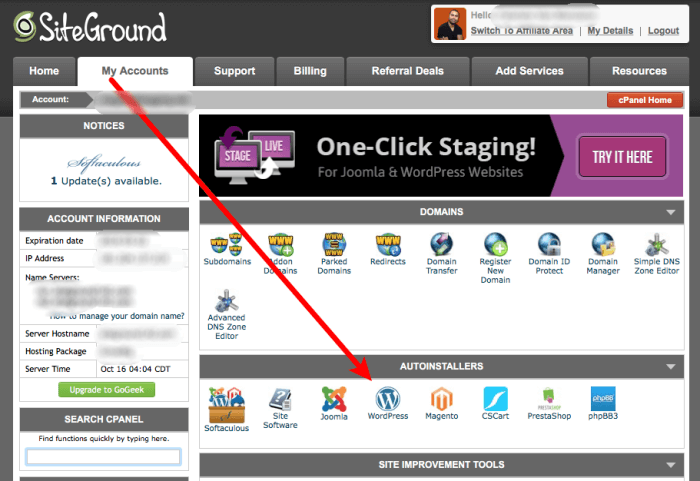 Step Two: Scroll down and click on the WordPress icon under 'Auto-installers'. See image below. Step Three: Click Install and then enter the details for the installation. You should always select the https://www. protocol if this is available. If you don't see it here, then you'll need to enable https on the domain using Let's Encrypt. Check out this post to learn how. Next, select the domain name in which you would like to install WordPress. Step Four: Continue with the setup by giving your blog a name, description, and admin username and password. Keep these unique from your web hosting username and password, and always have them accessible from a safe place. You'll need them to log into your blog after the installation is complete. Choose an admin email address and language, then select the security plugins you'd like to have installed with your initial set up. The Limit Login Attempts plugin is highly recommended. It will help you track and block brute force login attempts made on your site, including the responsible IP addresses. Step Five: When you're all done, just hit the install button and let the magic happen. When the installation process has finished, you will be notified. You should see a Congratulations information page containing your blog URL address, username, and login password. See image below. Use these credentials to log into your new WordPress site. OK, so at this stage you've pretty much completed all of the main steps for setting up your WordPress blog, and you're almost ready to start blogging and writing your first post. Next, let's do a little WordPress blog configuration. We'll start with installing a few 'essential' plugins. Once again, assuming you are new to all of this, plugins are part of what makes the WordPress open-source platform so flexible. You can pretty much create a WordPress website and make it do what ever you want it to do, simply by installing and activating a variety of function enhancing plugins. You can find a wide range of plugins in the ﻿﻿﻿WordPress repository here﻿﻿﻿. There are currently over 50,000 to choose from. 1. WordPress SEO by Yoast - This is by far the most powerful and complete on-page and site-wide SEO plugin available for WordPress, with over 5 million downloads to date. I'm currently using this plugin on Magnet4Blogging Media. If you're looking for something a little more advanced, with additional features, I'd also recommend trying SEOPressor Connect, however, this is a premium service that will set you back $9 per month subscription. You can compare the two SEO plugins above here. 2. WP Super Cache - This plugin will generate a static HTML file from your WordPress blog. After a HTML file has been generated, your web server will actually serve that file instead of processing the heavier WordPress PHP scripts. This simply means your site will load faster, and less demand will be placed on your server. Your users will see cached versions of your pages. 3. Google ReCaptcha plugin - This plugin is 100% free and you can use it to help reduce comment and contact form spam as your blog begins to get popular. 4. Monster Insights for WordPress - Must have plugin to help you install the Google Analytics tracking code into your blog. 5. Social Warfare - This is a powerful, lightweight, fast loading social sharing plugin that will help your site visitors share your awesome content on social media. There is a free version and pro version of this plugin. So, those are just a few of the essential plugins I would recommend you install when setting up a WordPress blog for the first time. There are many more others that you will come across in the future, and you'll probably want to try some out, however, don't get too carried away installing too many plugins, as this can contribute to slowing down your blog and page loading time. Check out this blog post on essential things to do after installing WordPress for more plugin and WordPress configuration tips. Once you've logged into the back end of your WordPress blog (dashboard), simply scroll down and in the right sidebar you'll see plugins. Hover your mouse over the plugins link and it will open up a drop-down menu with more options, simply select add new. See image below. Your dashboard will look a lot different from the image above, but the navigation and process is exactly the same. Once you're on the plugins page you can then search for a plugin you want to install, or, upload one that you've downloaded from the WordPress repository into your site. See image below. OK, so the last part of setting up your WordPress blog is installing a theme of your choice. A theme is also known as a skin, and it is what makes each WordPress blog/website unique and different. On its own, WordPress is just a content publishing/management platform. By default, your blog will have the Twenty Nineteen theme installed. If you're looking for a more personlized look and feel for your WordPress blog, I would recommend using a premium, customizable theme such as Genesis Theme Framework. It's reliable, robust, and well-coded. And, child themes for Genesis are relatively easy to configure and customize. I've been using Genesis for my website here at Magnet4Blogging, and for my clients websites since 2010. 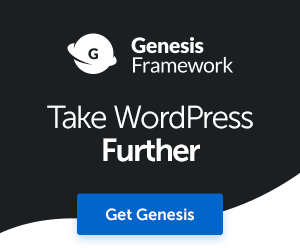 You can check out my detailed review of Genesis Framework here. If you happen to choose Genesis, here's a quick video tutorial on how to install the theme into your brand new WordPress blog. The video is almost 7 years old now, but the process of installing this theme software into WordPress hasn't changed at all. One option you have is to hire a web designer or developer to help you create a very unique look for your WordPress blog, however, this can be costly and if you're just starting out, you're probably better off just using a premium theme for the time being. If you'd like to consider a customized Genesis child theme for your blog, click here to see how I can help you with this. So, that's it! You're all set up ready to start blogging like a true pro! If you want to learn more about the tools I'm using to grow my blog and online business, please do check out my resource page. If you'd like to find out more about my website and blog design services, click here.